Connectable Building Blocks Made From Natural Rubber. Stuff Points: Earn 27 points when you buy this stuff. Squeezably soft blocks that connect for building. They look similar to traditional plastic bricks, but these are larger, slightly fuzzy, and they squish when pressure is applied for added grip, and increased fun. The bump on the top side of one unites with the indent on the bottom side of another for easy joining, and semi-permanent structure creation. From towers to fortresses, kids can stack, un-stack, combine and create for hours of imaginative play. The substantial pieces allow for a sturdy build, and the large connectors are easy for the smallest hands. 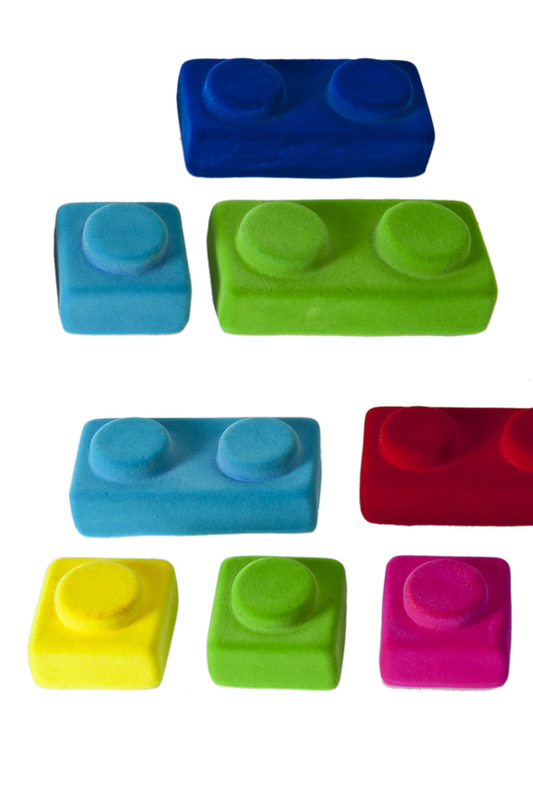 Made from a natural rubber, and covered in a nylon flocking, these vibrantly colored blocks are fun for all ages. They mash when stepped on, and bounce when dropped or thrown. The softer material is less rigid than plastic options, so it is easy to grab, but also less likely to cause damage, or break with use. Each set includes 20 pieces. You get 10 large blocks with two connection points, and 10 small ones that have a single connector. The individual blocks are relatively small for Rubbabu standards, but large when compared to other building toys. Each piece will measure 2" x 2" or 2" x 4". Connectable. Not all blocks stick together. The connectors add sturdiness to creations, and reduce frustration because things stay together better. Eco-Friendly. The natural rubber material is made from pure tree sap with no fillers. This renewable resource keeps trees alive while providing a durable material that is safe and biodegradable. Durable. Kids won't break them, they won't lose shape, and they will basically never wear out. High quality materials ensure a long product life. Safe. Naturally safe to play with, the soft and enjoyable material is also anti-microbial, dust mite resistant, mildew resistant, hypo-allergenic and flame retardant. Pthalate Free. Other rubber toys utilize this questionable substance as a softener. This one does not. Fun For All Ages. Safe for the youngest among us, but also irresistible for older children and adults alike. Look And Feel. Silky soft in their hands, and delightfully squishy when they squeeze. The materials could not be more inviting, but the vibrant colors and simple shapes add to the attraction. Made in India using the safest and most pure components possible, these toys need to be felt to be appreciated. They are substantial in weight, and quite sturdy, but they are also squeezable and bendable. The durable rubber core is coated with a soft and fluffy nylon flocking that children love to touch. Paints are sourced from the United States, and the velvety coating comes from the leading producer in Switzerland. Natural rubber with no filler material is the main ingredient, and it makes a great choice because it is durable, but also far more renewable than wood or plastic. Each toy is hand crafted, and finished with bright colors and fun details. Void of BPA and pthalates for added safety, you can let your children enjoy without worry. The toys themselves are biodegradable, and most byproducts that result from the manufacturing process are recycled and used again. These award winning toys are the perfect high quality alternative to cheap rubber and plastic options, and an ideal substitute for wood toys that will keep the tree alive. Order Yours Today! Dimensions 2" x 2"or 2" x 4"
Color Multiple - blue, green, red, orange, etc. Cleaning Surface Clean with damp cloth, do not machine wash. 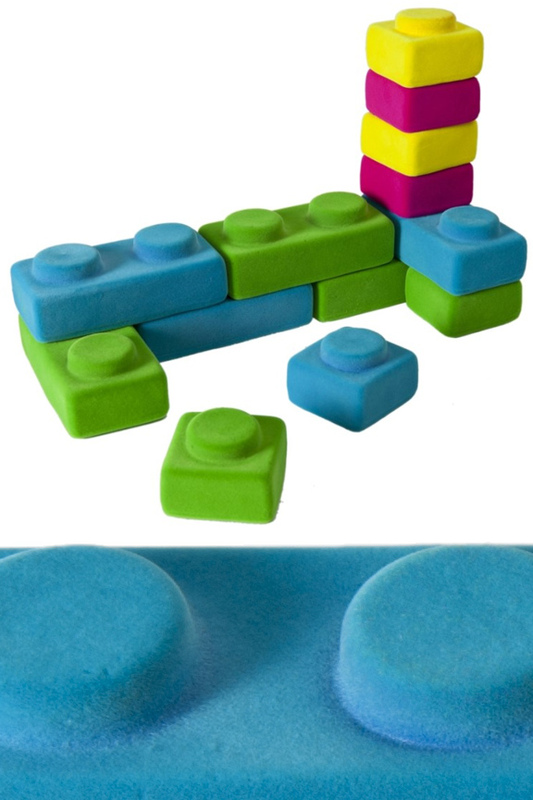 Durable building blocks made from soft materials. Connect them together to build structures and walls. A velvety coating is super soft, and squishy material makes them easy to grip. Order Yours Today! Six Pins And One Ball Made From Natural Rubber. Squishy Fun For All Ages.